Global demand for cooking appliances will rise at a 5.5 percent annual rate through 2017 to $65.4 billion. The US will remain the world’s largest consumer while China will be the fastest growing. Higher value products will lead gains in developed countries, while first time appliance purchases will dominate developing country markets. 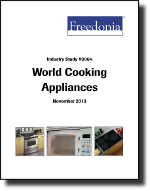 This study analyzes the $50.1 billion world cooking appliances industry. It presents historical demand data for 2002, 2007 and 2012 with forecasts for 2017 and 2022 by product (e.g., microwaves, cooktops, hoods, ranges, ovens, commercial cooking appliances), world region, and for 17 countries. The study also considers market environment factors, details industry structure, evaluates company market share and profiles 43 industry players, including Electrolux, BSH Bosch and Siemens Hausgeräte.